Roughly three-fourths of America’s ultra-wealthy individuals will be passing their wealth on to their children (74 percent) and their spouses (73 percent) according to a new wealth level study conducted by Spectrem Group, households with a net worth of at least $25 million (not including primary residence). 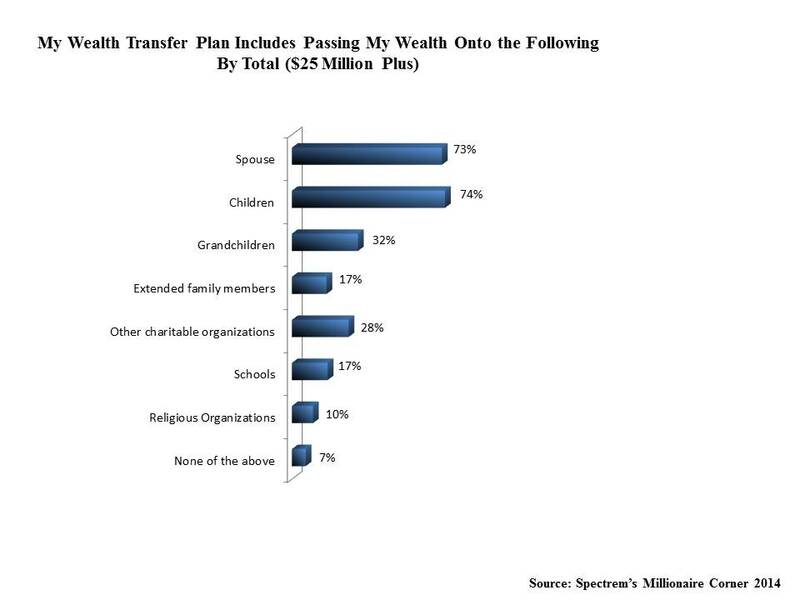 One-third report they will pass their wealth on to their grandchildren, while nearly three-in-ten (28 percent) will be leaving assets to charitable organizations. Next in line to receive the ultra-wealthy’s largesse will be schools and extended family members (17 percent each) and religious organizations. Ultra-wealthy respondents over the age of 65 are significantly more likely than their younger counterparts to have their wealth transfer plans in place. Nine-in-ten report they will be leaving assets to their spouse while 86 percent said they would be leaving assets to their children. They are more than twice as likely as respondents overall to say they will leave assets to their grandchildren (66 percent vs. 32 percent). Ultra-wealthy seniors are also most likely to leave assets for charitable organizations (41 percent) schools and religious groups (16 percent); for extended family members, not so much (14 percent). About two-thirds (65 percent) of $25 Million Plus households have spoken with their attorney about wealth transfer plans, while 62 percent report that they have discussed this with their financial advisor. Half have talked with their family members. Baby Boomers ages 55-65 are the most likely to have talked to family members about wealth transfer (61 percent). The financial well-being of children and grandchildren is of paramount importance to ultra-wealthy households, the report finds. More than maintaining their financial position, ultra-wealthy respondents say they are most concerned about raising their children to be financially responsible and ensuring that family wealth does not have a detrimental impact on work ethic or educational or career attainment. To that end, roughly half of respondents (48 percent) state that it is important that their financial advisor or provider have programs to educate their children or grandchildren on wealth.